These education computer trolleys are available for a free UK mainland delivery within 2 weeks from the order are available in 3 different frame colour options that are available in Red, Blue or Grey. These trolleys are height adjustable. These trolleys are mounted on heavy-duty rubber castors two of which are lockable and available for a free UK mainland delivery. Available with a frame that is available in 3 different frame colours that are in Red, Blue or Grey. 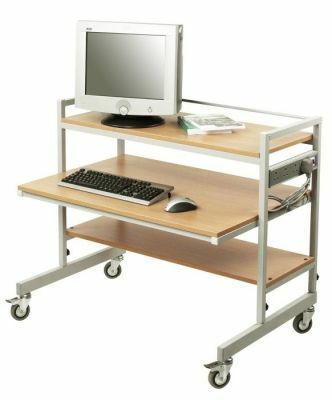 These trolleys are height adjustable and have two tiers that increase the space on the desk. Available with a Beech desktop and are delivered fully assembled. There is a 2 week lead time available with these products.